Visit Adtollo at Geo Business – the geospatial event i London! Visit our stand J13 at GeoBusiness in London, May 21-22! Topocad training courses – now for free! At KTH Royal Institute of Technology, the future civil engineers can broaden their knowledge in 3D and BIM. The course “Geodetic Survey Technology” mixes theory with laboratory work. Students increase their understanding of the 3D model and how it relates to the digital development. Here, Topocad is an educational tool. No one can have missed the profound digitization of our time. It permeates the whole community, including higher education. At KTH, civil engineers are trained in the Construction Engineering program, and GIS and BIM are hot topics. This year, the course “Geodetic Survey Technology” is given for the first time. It’s a part of Geography IT, which students are able to choose in the third year. – Today, people talk alot about smart cities and 3D models, and BIM is very important in the civil building process, says Mohammad Bagherbandi, the course manager. During the course, students gain practical experience in working with GIS information and this is where they get familiar with Topocad. Why have you chosen to use Topocad in the classroom? – Our intention is to use the same software that the students will use at their workplace in the future, and Topocad is one of the most widely used softwares, says Mohammad. It is very important that the students get an orientation about the software that the Swedish National Land Survey and other authorities use.But instead of giving students a bit knowledge in a bunch of softwares, one would rather focus on a few and give an idea of the full potential of the softwares. – Therefore, we want to educate students in various softwares including Topocad. At the department, they keep an eye on technology development that takes place in different areas of the GIS world. – For us teaching at the university, it’s important to be in touch with the industry and we are following the development, says Milan Horemuz, associate professor at the institution and colleague with Mohammad. This is one of the reasons for building relationships with Adtollo. Two years ago, Adtollo was contacted to discuss how Topocad could become an educational tool in teaching. An additional reason for choosing Topocad is to connect the geodetic surveys to a CAD environment, and to 3D. It matches well with the educational need, for the students to get an understanding of 3D and the evolution of digitalization. At KTH, the students not only get a profound knowledge injection but also prepare them for the comptence requirements that the profession calls for. Nicklas Lundström at Adtollo has served as a guide and is the one who has introduced Topocad to Mohammad and his colleagues. Using a new software during teaching raises questions and considerations about functionality, application areas, and the role of the software in the information chain; from the surveyed data to creating solids in a 3D environment. An example has been to determine LOD levels (Levels Of Details) on the solids of the 3D models. At KTH, students can practice various tasks that are performed daily in terrain and in office, such as how to work systematically when collecting data, coding, how the information flow works and how to export data from Topocad to other softwares for visualization or presentations. The students haven’t only worked with Topocad in the classroom. They’ve also taken the step into reality. In a laboratory, the students were given a task of creating a 3D model of a building on the KTH campus. The students were divided into groups and went out with instruments and surveyed the building. – One group surveyed the front of the building, another group surveyed the middle part and the third group surveyed the back part. Information was collected into a database which the groups used to create a 3D model of the building using Topocad. Also, they had to add the appropriate LOD level. The groups’ results differed slightly, the 3D models were not completely identical. Nore, this was the purpose of the exercise. The important thing was to get an insight of the workflow, Mohammad points out. In the course, they will add more laboratory exercises in Topocad. Knowledge and experience grow and can engage the interest in exciting ex-jobs in the final stages of the education. Competence increases and helps the students becoming more employable, which is important to ensuring the supply of engineers in the GIS area. The new version of Chaos desktop is now available for download from our homepage. The new version includes several new functions and enhancements. What’s going on at GEO Business 2019? Are you coming to London for the GeoBusiness show in May? Please visit Adtollos stand J13 where we show Topocad and how it can help you in your daily work. As we are planning to phase out the connection to iBinder in Chaos desktop, we want to offer our customers using Chaos desktop with iBinder a deal on Congeria. The development of the connection between Chaos desktop and iBinder (formerly Pärmen) is planned to be phased out with Chaos desktop version 9.0. A new version of Topocad is out there with a lot of exciting news and enhanced features. 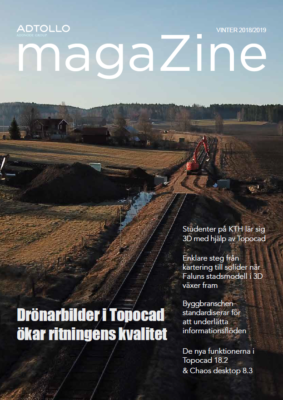 Download Topocad 19 See our demos where we show the Topocad 19 news (in Swedish) Read all the news in version 19 What is new then?